First thing this morning I had a 2 hour meeting. Oh boy. Not a morning person + 2 hour meeting = Coffee!!!! 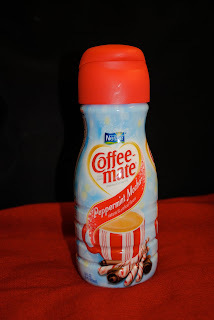 I’m still searching for the Christmas spirit so I added some Peppermint Mocha coffee-mate! This was oh so tasty! I love this bottle. 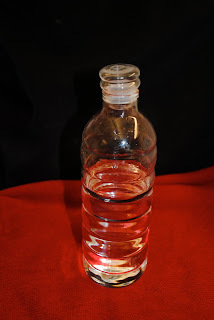 It looks like one of those plastic water bottles but it is made of glass so it is reusable! A fruit cup filled with kiwi, strawberries and pineapple. This fruit was so good but what else would you expect from Whole Foods! The husband and I stopped at Ceres after work. I started off with a Captain Morgan Diet Coke to drink. To eat I had a GREAT salad. ALL the veggies tasted so fresh which is a-mazing considering it is in the dead of winter! Have you ever been out of the holiday spirit, if yes, what did you do to get back into the holiday spirit? I don’t have an answer for this one. I’ve tried Christmas music and movies, looking at pictures but nothing has worked. Suggestions would be greatly appreciated!